A Seattle-based private company, FELINE announced today the release of a revolutionary new development in interactive advertising and marketing. Combining game-changing mobile ad units designed specifically for cats with a substantial network of tablet publishing partners whose interactive experiences have attracted a considerable feline audience, FELINE has developed the first ever interspecies ad targeting in media history. Developed by ’s Functional Excellence Lab of Interspecies Network Engagement [FELINE] this tectonic shift in audience targeting and interactive mobile advertising reaches a completely new and highly-engaged consumer segment that have significant influence over household purchase decisions. Americans spend more than $41 billion every year on their furry family members [BusinessWeek Magazine] and the ability to reach, engage, and track our pets’ tablet behavior has effectively changed the way advertisers connect their cat products to the feline audience segment. 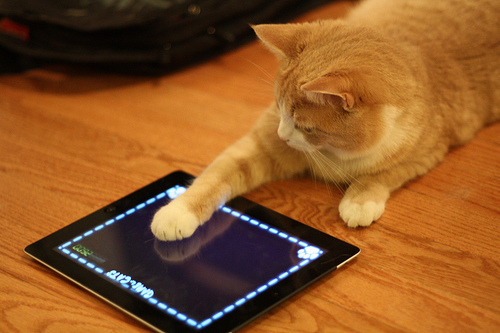 With over 86 million cats in the United States and 31% of American adults owning a tablet computer, the feline tablet audience growth has been outpacing the human one. FELINE spokesperson, Morris DelVecchio revealed the revolutionary platform was first discussed after Some key tam members at FELINE noticed that brands like Purina Friskies had developed tablet games for cats such as “Cat Fishing” and “Tasty Treasure Hunt” and then discovered there were 75,000+ results for cat iPad videos on YouTube alone. http://www.youtube.com/watch?v=vaif2uq_0Vc. An independent group or data scientists and UX experts assembled the FELINE initiative as a pet project then quickly formed the FELINE work group and created the cat network by combining a series of publishers, applications and experiences targeted at cats. A variety of ad servers and other targeting technology provided the technical backbone while the team developed interactive cat-centric tablet advertising units optimized for felines based on extensive research on how cats react to stimuli. Caching technology then stores the interactions with the interspecies-optimized ad units and then publishes this to a ‘meow list’ reporting interface that can then be viewed by the cat’s owner, effectively delivering a ‘shopping list’ of products and services paw-picked by their pet. "The introduction of these innovative ad units and assembly of the exclusive publishing partners adds to the impressive utility of this innovative technology and gives brands a completely new way to reach species beyond humans," said Morris DelVecchio, Executive Vice President, Sales and Services at FELINE. "Cats now have the ability to impact household purchase decisions that include everything from cat food and kitty litter to consumer durables such as furniture and bedding. And we’re currently exploring forays into how to apply the same mechanics to canine behavior and other domestic species in the animal kingdom. The Cat Network currently reaches nearly 9MM UF [Unique Felines] a month and traffic is growing monthly 10%-20%. The average PTR [Paw Through Rate] is well over 4%, reinforcing the value of this highly-engaged and influential consumer segment.